Victoria & Kirstin feel strongly about giving back to the community and have been involved with a number of charitable organisations over the years. They have supported Mary Potter Hospice, Oceanic Preservation Society, The Neonatal Trust, CanTeen, Ronald McDonald House Wellington and Women’s Refuge NZ. Neonatal Trust “Treasure” Necklaces by TORY & KO. Pearls have been donated over the years - the pearl being symbolic of bringing good health and fortune to children…. 2019 - Welcome Home Tour Raffle Prize Click here to be in to win! 2018 - Financial Markets Charity Golf Tournament - Pearl Rope Donated and sold for over $1,000! 2015 - TORY & KO. donated a pair of Pretty Collection Blue Topaz Bow Earrings (just like the ones that were selected by Palace Staff for The Duchess of Cambridge, Kate Middleton!) for a Charity event in Auckland. 10% of every website sale was also donated to The Neonatal Trust NZ. 2014 - TORY & KO. donated Pearl Bracelets for the Silent Auction for the Neonatal Trust Wellington's Winter Ball 25th July. 2010 - November 11th 2010 - TORY & KO created "ADORN" an event with 4 jewellery businesses (owned and operated by women) showcasing their Jewellery alongside Beauty, Hair stylists and Spa treatment services, bubbles and canapés on the top floor at the Majestic Center, Wellington. Over 120 guests attended this sparkling event. Carolyn Mettrick from the Neonatal Trust spoke on the great work the Trust was continuing to do and the jewellers donated 10% of proceeds from the night to the Trust. Women’s Refuge helpers receiving the presents. 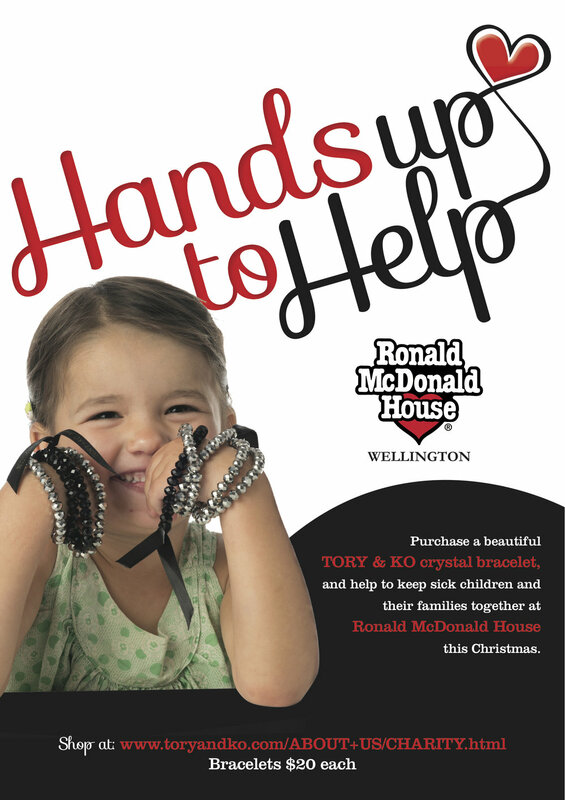 This Christmas we are lending a helping hand to Women's Refuge NZ again. For the past five years, with the support of our family, friends and loyal customers TORY & KO. have raised over 200 brand-new gifts for all the children who find themselves in a Refuge shelter during Xmas. Women’s Refuge shelter this year. Bring in a new child's present to our store to put under our tree. There are over 250 women and children on any one night in the 44 Refuges across New Zealand over the Christmas period. We feel strongly about giving back to the community and when we heard of the situation over Christmas for a lot of mothers and children we decided to help make a difference. Every Christmas TORY & KO. ask customers, family and friends to donate a brand new gift to be given to children who find themselves in a shelter during Christmas. The past five years customers and friends have continued to help TORY & KO. make Christmas a little brighter for the children and their mothers who need the safety of a Refuge House around New Zealand. Thank you to all our family, friends and loyal customers who brought in presents to support these children throughout NZ. We managed to raise over 200 presents for the children again last year - another great effort from everyone who supported this charity. TORY & KO. has raised over $4000 for Ronald McDonald House over the years. Victoria & Kirstin worked at The Great Gatsby Charity Event held at the Roxy and sold sparkly bracelets to everyone attending. 100 % of the proceeds were donated to Ronald McDonald House - nearly $2,000 for a night of selling sparkles! Over Christmas TORY & KO. raised an additional $1,620 for Ronald McDonald House with proceeds on the bracelets sold during the 'Hands up to Help!" Xmas Bracelet Campaign and Victoria and Kirstin presented this to the Chief Executive, Lesley Slieker.